Many new Roku users are frustrated when they cut the cord expecting to get all their favorite cable channels, like Disney, Animal Planet, The Food Network, and HGTV, for free. Yes, those channels are on Roku, and they are free - but only if you subscribe to a "participating cable or satellite TV provider." These channels are part of the TV Everywhere business model used by many TV service providers. Here are answers to the questions we get most often about the availability of cable channels on Roku. A: Under the TV Everywhere concept, television networks let viewers watch content from their channels across multiple platforms. In addition to traditional pay TV (cable and satellite) services, viewers can watch video on their computers, through streaming media players (such as Roku and Apple TV), and with mobile apps. However, underlying the TV Everywhere business model is the requirement to subscribe to a cable or satellite provider, usually with a subscription package that includes the TV Everywhere channel in question. To receive all of the content through a platform other than cable or satellite, you must verify, or authenticate, your subscription. For this reason, TV Everywhere is also called authenticated streaming and authenticated video-on-demand. Q: Why am I required to have a cable TV subscription to get TV Everywhere channels? A: Only a portion of a TV network's revenue is covered by advertising. A large portion comes from fees paid by the cable companies. In fact, it's been reported that nearly two-thirds of ESPN's revenue in 2014 came from subscription fees paid by cable television customers. Network's are not going to cut off that revenue stream by giving all of their content away. Q: It's stupid to have a Roku channel that requires a cable subscription. If I get the channel on cable, why would I want to watch it on Roku? A: TV Everywhere channels offer large libraries of video on demand. Whereas cable offers only the linear channel feed for most channels, you can watch many hours of previously-aired episodes on the corresponding Roku channel. For those Roku channels that also include the live feed, this frees you from the need to have a cable box on every TV. If you don't want to pay rental on a cable box in the rarely used guest bedroom, put a Roku in there when the in-laws come to visit so they can watch TV. Q: Are there any free videos on TV Everywhere channels on Roku? A: Yes, many channels have a number of "unlocked" videos available for viewing without having to authenticate. All channels let you install them on your Roku and most will let you browse through all of the content. Many channels offer several free episodes, and you'll sometimes find clips, behind-the-scenes videos, and other promotional content for free as well. Q: How do I authenticate a TV Everywhere channel on Roku? A: Although there are variations, most TV Everywhere channels on Roku have a similar process. If you try to watch a "locked" video, you will usually be sent to a screen that provides instructions to "authenticate," "activate your Roku," "link" or "log in." Oftentimes the * button on your remote will launch a menu with an option to do the same. The instructions will usually tell you to visit a certain website from your computer or mobile device. From there, you will need to enter the code shown on the Roku channel's instruction screen and select your cable or satellite TV provider. (Note that codes expire fairly quickly. If it takes you several minutes to go to the website, you will likely need to get a new code.) If you entered a valid code, you will be redirected to your TV provider's website where you will have to login. The login requires your pay TV username and password - not your Roku credentials! After successfully logging in, the Roku channel will automatically refresh, or the instruction screen may require you to select a "continue" button. Q: How do I authenticate a channel if my cable TV provider isn't listed? Why doesn't Roku let me watch a channel without a cable TV subscription. A: If your cable TV provider isn't listed when you go to the activation website, you're out of luck - this means that your TV service provider doesn't allow their customers access to the full content of that channel. This is not Roku's fault. Each TV service provider negotiates with the TV networks over allowing access. If you're left out, it means that your cable provider didn't agree to let their customers watch the channel on Roku. Your only recourse is to contact your cable or satellite TV provider and request that they allow access. Q: I don't have cable TV service, but I'm willing to pay for a specific channel. How do I subscribe directly to that channel? A: Sorry, but most of the TV Everywhere channels do not let you subscribe directly. These channels are available as a free "bonus" to those who pay for cable or satellite TV service. 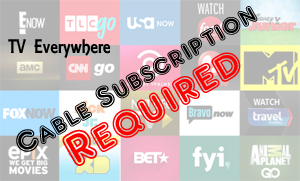 There are some exceptions for "premium" services such as HBO, Showtime, and Starz, but these will usually have two channels - one for cable subscribers and one for direct subscribers. HBO GO, for example, requires that you authenticate through a pay TV provider, while HBO NOW lets you subscribe directly, with no cable subscription. Q: I authenticated a channel but when I try to watch that channel on Roku it gives me an "unauthorized" error - what wrong? A:If the authentication page on a channel's website said that you successfully authenticated, but your Roku tells you that the content you're trying to stream is unauthorized, you probably don't have a qualifying channel package from your cable provider. If your cable TV subscription doesn't include the TV Everywhere channel that you're trying to authenticate, you may not be able to watch that channel on your Roku. If you have trouble, contact your cable TV provider for assistance.